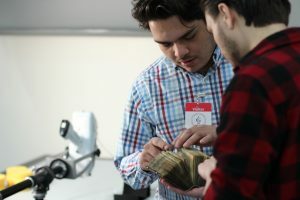 This Spring, students coordinated an X-ray fluorescence (XRF) analysis of Northeastern’s only Medieval manuscript, the Dragon Prayer Book through a collaboration with the Isabella Stewart Gardner Museum. This is what they had to say about the experience. By Professor Erika Boeckeler (Faculty Project Head), Laura Packard (Student Project Head), and Zakary Ganhadeiro (Project Member) on behalf of the Dragon Prayer Book Project Team. Interviewed by Jon Reed (Snell Library) What inspired you to take a closer look at Dragon Prayer Book? We were inspired by the mystery of the manuscript; very little was known about it before we began our research. The Dragon Prayer Book is beautiful and intriguing, and so multi-dimensional in terms of the questions we can ask of it, e.g. sociological, literary, religious, material, etc. 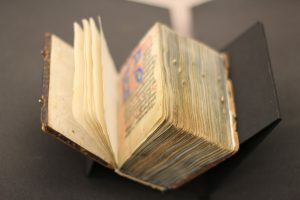 As Northeastern’s only medieval manuscript, the book is an original object which has become a hub of interdisciplinary research. 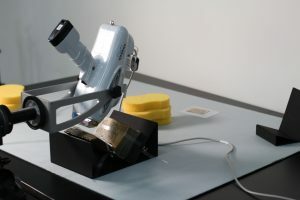 The book has provided a sort of bridge between departments, and each new experiment or test proves this connection to be stronger. With each new discovery we make the book reveals more of itself to us, and with each revelation come new surprises and twists in terms of our research path. While much is known about the book, there is still plenty that can be discovered, or even already known information that can be confirmed. How did you determine that XRF analysis was the next way forward? When looking for new ways to interact with and study the Dragon Prayer Book we came across X-ray fluorescence (XRF), a very simple and noninvasive test that produces decisive results. We attended several lectures on the latest developments in biobibliography and other ways that science is being brought to bear on book history and Humanistic questions, and were eager to take advantage of our interdisciplinary expertise and local resources. When Zakary Ganhadeiro joined the project last fall, we were excited by his interest in spearheading the bioanalysis of the Dragon Prayer Book, and by the prospect of gaining a new understanding of the prayer book through the field of bioarchaeology. What did you discover about the Dragon Prayer Book via XRF analysis? The analysis mostly confirmed what we suspected about the inks– that they were fairly typical for a southern German late medieval manuscript. However, we did learn that the black ink has an unusual amount of zinc in it, which led us to consider investigating the geologic composition of the mines around Regensburg, Germany, where we think the manuscript may have originated. Why is collaboration important when doing research in 2018? There are so many different kinds of scholarly questions we have about this manuscript, and no one person or tool will ever be adequate to the understanding the complexity of its world. We need a diverse team of experts and different tools of varying sophistication in order to piece together this knowledge puzzle: experts on bindings, on late fifteenth century music cultures and on their Latin, on ink composition, on tests to determine what kind of animal was used in making the parchment, on manuscript scripts, on early modern paper and watermarks, on websites that best display our findings, on conservation, to name even just a few. You can see some of what we’ve investigated at www.dragonprayerbook.northeastern.edu. Cross communication also allows for the better sharing of ideas, and the better publicizing of research. While this was only a small test, on a larger scale, more collaboration can lead to larger discoveries on all fronts. How did the Library impact you/your research? Giordana Mecagni, NU’s archivist has promoted student research on this manuscript from our first expression of interest in it. She found the funds to digitize it, sent it to restoration, and has granted permission to perform non-invasive scientific analysis. She has supported our efforts by facilitating access to the manuscript, including at the public events we have organized. The Library staff has been incredibly supportive and easy to reach throughout this whole process, and they truly made the collaboration with the Isabella Stewart Gardner Museum possible. We recognize that not every archive supports student research in this way, and we are very fortunate to have a Library that promotes our learning to such a degree.